The colour in the photo above was very close to the actual paint colour. We drove out to Delta to pick up some MMS Tough Coat at Painted For Love and there was a good display of Fusion Mineral Paint from Homestead displayed right beside MMS Paint and Supplies. I chose Heirloom Fusion and discovered it is not chalk paint. The colour chart image below is from here. Homestead's Facebook Page here, Blog here. Lots of 'how to use' information available. A lovely paint, covers very well on unpainted wood (which is what I used). Self levels, leaves no brush marks. Has a satin finish and doesn't need waxing but it can be waxed. The projects below were bare-wood before I started. Made a thin wash of Heirloom Fusion (2 water to 1 paint) for a sign, brushed on and wiped lightly. My evening photos looked more blue based than green. 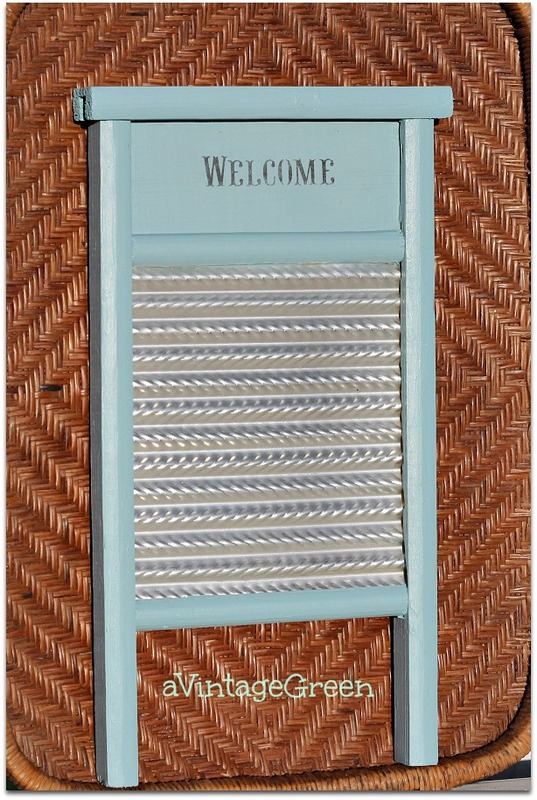 The sheen on the washboard was 2 coats Fusion Mineral Paint, dried. Thats it. 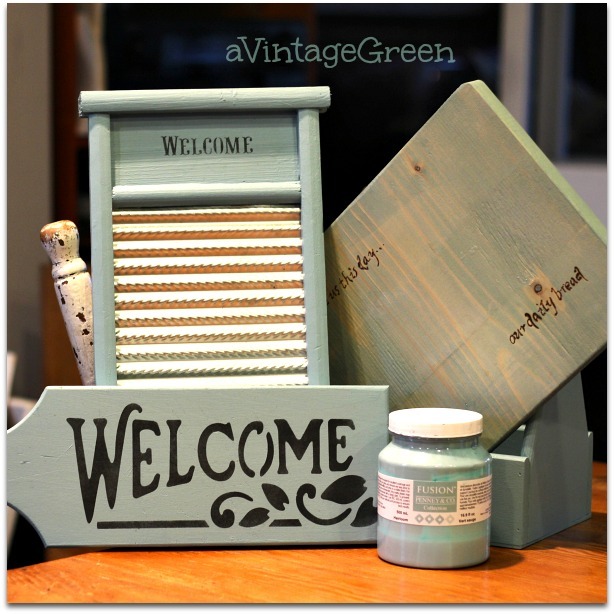 Painted a faux washboard plus added a Welcome stencil. This was my favourite of the four small projects. 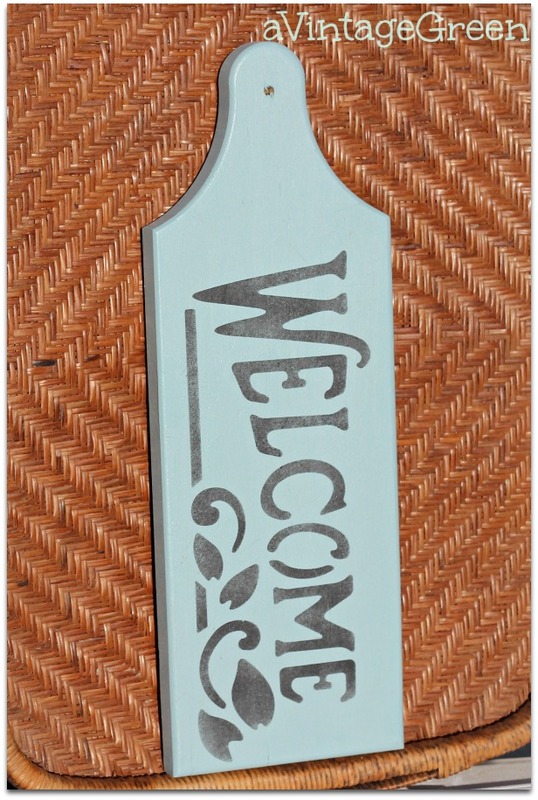 Painted a used cutting board and added a Welcome stencil. Painted a small tote, covering up the original 'house picture' stencil with no problem. No odour. Easy to use. Dries slower than chalk type paint and needs a couple of weeks after painting to cure to a hard finish. Needed to use dish soap/water to remove from brush and hands. Different than chalk paint which rinses off a brush/hands with water. My original shopping intention was to pick ups some MMS Tough Coat to seal the flaking legs on an old table we are working on (maybe a post on that product another day). Just so you know, I was NOT asked to write about my opinion of Fusion Mineral Paint, I just wanted to try it and see if I liked the result. I did. Donna of Funky Junk Interiors painted her front door with Fusion Paint here. Joy - all cute projects! That color is gorgeous!! 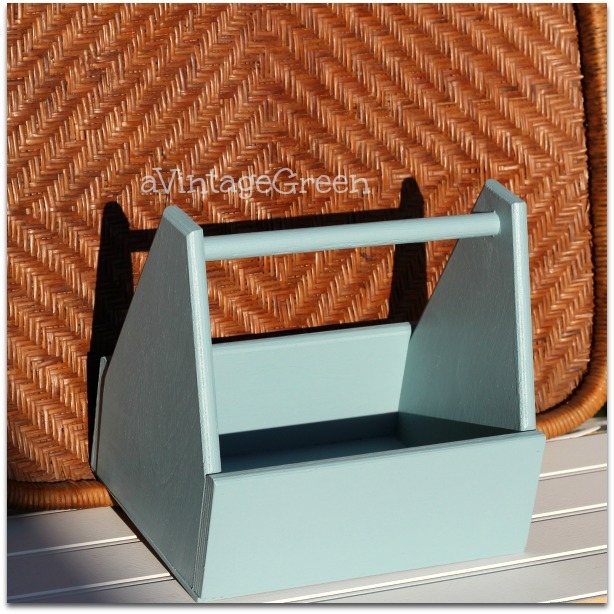 It'a a "Pastel Day" here (sounds better than gloomy) and I might just copy your ideas and stencil an old tool box. You had me at "leaves no brush marks." I loathe brush marks, especially if I wasn't planning on distressing a piece. Great color choice, very pretty and perfect for Spring. Oh I love the color and you transformed so many pieces. We so appreciate you joining the Thoughts of Home on Thursday gathering. May you have a delightfully lovely weekend. This is a great project, as well as an honest opinion on some products. We will be featuring you this week at TOHOT under the DIY category. 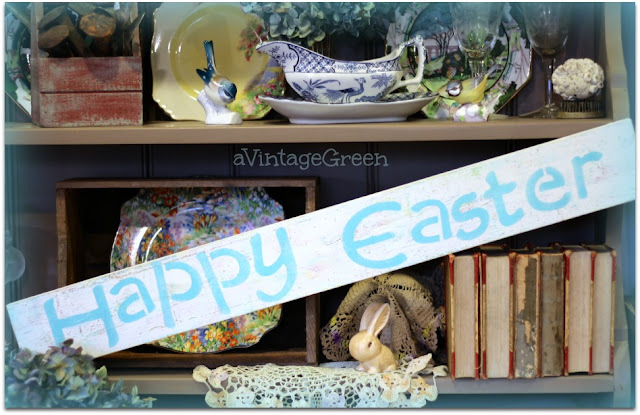 Please feel free to join us today for our Garden Party series link up too! I love that colour it is so beautiful, just like your projects! The small tote especially, you can decorate in so many ways with it!